We are off to see Grug today at the New Victory. 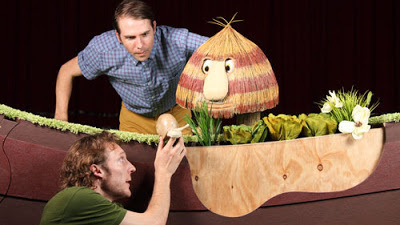 Grug is an Australian puppet show designed for the younger set by Adelaide Australia based Windmill Theatre, one of the best and most inventive children's theatre companies in Australia. Grug began his life as the top of a Burrawang tree that fell to the ground. Resembling a small, striped haystack with feet and a nose, Grug is fascinated by the world around him and solves everyday problems creatively and without fuss. When dancing instructions are too difficult to understand, he invents his own dance and calls it ‘The Grug’. When snails eat his cabbages, Grug plants more cabbages so there will be enough for both him and the snails. A tricked out set with delightful doohickies and theatrical thingamabobs makes flowers bloom and veggies grow. Although we haven't seen it yet, I'm sure it will be beautifully done and inspired visually. Every show we've seen in the New Vic's shows for young young audience series has been this. There will be several moments of audience interaction, and probably a chance for everybody to get out of their seat and dance. Pre-show there will be an arts and crafts time to create a memento to take away from the show. I don't mean this in a bad way, but the New Vic has a bit of a formula for making great children's theatre experiences, and it really works. Very young kids have supportive nurturing experiences in the theatre and want to come back for more! Grug is a 45 minute production and recommended for ages 2-5.